HR departments have more tools at their disposal for ramping up recruitment and hiring than ever before, and technology plays a huge part in keeping the industry current. In 2017, the push toward a 100-percent-digital hiring model is a consideration as mobile and cloud- based solutions continue to gain popularity. A desire to attract top candidates and have them view organizations and their brands as on the cutting edge are at the heart of these trends, and RPO partners are helping lead the charge. For Patricia Tourigny, senior vice president of HR shared services at Magellan Health, this process involves letting automation take care of the details so that recruiters have more time to focus on the candidates. Magellan is far from the only organization turning to automation as a way to increase efficiency. On the contrary, this technology is in demand for companies in numerous industries and has been added to the wheelhouse of many RPO providers. According to Randstad Sourceright’s latest Talent Trends survey, 84 percent of U.S. business owners said they believe artificial intelligence (AI) and robotics will have a positive impact on the workplace in the next three to five years. Further, 48 percent said that automation and machine learning has either transformed or had a positive impact on their business in the past 12 months. AI tools have the capacity to take over mundane and time-consuming tasks such as skimming resumes for keywords, sending follow-up emails to candidates that aren’t a good fit, and scheduling interviews. Some AI tools can even help find passive candidates online; others include “chatbots” (also known as conversational AI) that can field basic HR questions for career site visitors. will continue to expand, and as this happens, time to hire and other important recruitment metrics will see improvements. Despite some concerns that AI will displace recruiting jobs, most talent acquisition (TA) professionals are confident that recruitment will always need a human touch. 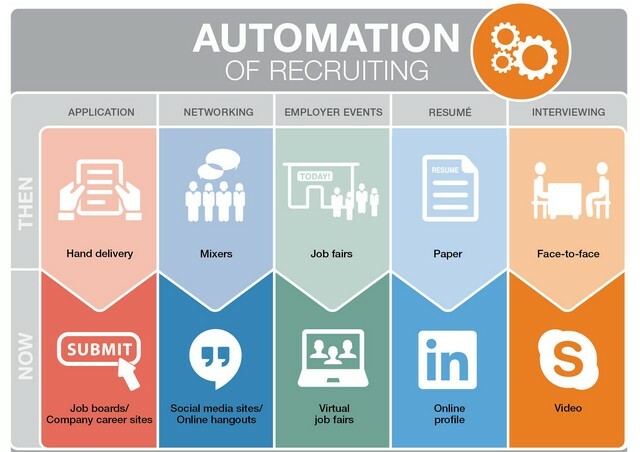 Undercover Recruiter estimates that 100 percent of source and match tasks are automatable, but only between 20 and 24 percent of TA-related management and sales tasks are automatable. In other words, human beings will always have an important role to play in promoting the employer brand and creating a positive candidate experience.